Ok So I know I have been referring to a ShopQuest for the past 2 years now. Well guess what I am finally doing it, with the time I spent in the shop this year thanks to my blog I decided I needed to move some things around. So most of the month of February is going to be dedicated to reorganizing and rearranging my shop. I even got an early start. I like the workbench I have (it was left behind by the previous owner) but the way I had it situated took up to much space. As did my previously built wall cabinets. Also you will notice the so planned assembly table. It served to collect not only dust but everything else I did not care to find a place for over the past few years. 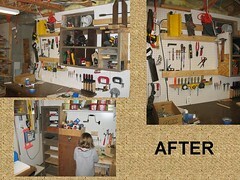 So over this past week I created a new work area for my daughter with the assembly table and the space that it was in. You can see that project here. 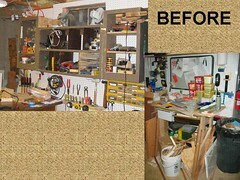 Today I tackled the wall and workbench issue. I am very happy with the amount of space that this change opens up.As well as the tool storage above my bench, its nice to get some of my handtools in easy reach. I do have plans to possibly attach some casters to the workbench so I can swing it out from the wall when I need to. I like the ones from Rockler which will raise to to move then drop it back down. I also am planning to build a few more custom wall racks for some of my tools and get the metal hooks off the wall as much as I can. I am looking forward (with fear and joy) to the next phase which will see me moving my Lathe, Drying Rack and Lumber Rack (which is way more filled them pictured in this post) to other spots in the shop. I am planning to blog on this as I do some of the work as I did find it kept me motivated to do things last year. So hope you all enjoy, any suggestions or questions you might have feel free to chime in.